In a recent survey from the National Rosacea Society, 79 percent of rosacea patients named emotional stress as one of the top causes of a flare-up of facial flushing. While the causes of stress ranged from family and career concerns to finances, health, and social pressure, the outcome is the same across the board: red flushing that then leads to embarrassment and even more stress, thus perpetuating a vicious cycle. Moreover, 69 percent of rosacea patients stated that this type of stress-induced flare-up happens at least one per month. So why does psychological stress cause rosacea flare-ups for so many people? The answer has to do with the link between stress and inflammation. When we feel stressed, anxious, or worried, our brains release various stress hormones, including corticotropin-releasing hormone (CRH), glucocorticoids, and epinephrine. This surge of hormones triggers a wide range of responses throughout our bodies, including our skin. CRH, for example, impedes the regeneration of new cells called keratinocytes within the skin, as well as stimulates various inflammatory pathways. Cortisol, a type of glucocorticoid, is another main stress hormone that triggers a wide range of responses. High levels of cortisol have been shown to suppress the immune system, which can further impact the skin’s barrier function and the body’s ability to regulate inflammation. When inflammation is “turned on,” your blood vessels become dilated and sometimes “leaky,” which leads to that flush of facial redness in rosacea patients. The problem is that once these inflammatory pathways are turned on, it is very difficult to turn them back off, because they stimulate many other pathways and have a domino effect. When under constant stress, your body continually produces excess stress hormones, which keeps these inflammatory pathways turned on, making it difficult to manage facial flushing and other symptoms. 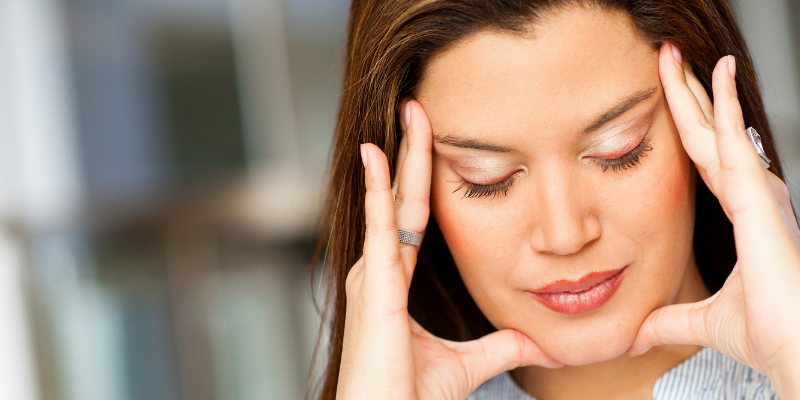 Does Stress Management Help Rosacea? Yes, finding ways to better manage stress can lower the number and severity of flare-ups you have. In another survey of more than 700 rosacea patients, researchers found that over 67 percent were able to significantly reduce rosacea flare-ups by taking steps to reduce emotional stress. While we do not yet have a cure for rosacea, combining stress management with the proper skin care routine and prescription medications such as Rhofade™ can help people with this condition live a happy, healthy live with fewer flares. Some amount of stress and worry is a normal part of life, but constant stress can lead to a variety of health and skin issues, including increased rosacea flare-ups. If you are struggling to manage your rosacea symptoms, talk with a board-certified dermatologist about the proper skin care products and medication to help control facial flushing. Pair these recommendations with healthy stress management habits and trigger avoidance. For more skin care information, advice, and how-to videos from Dr. Leslie Baumann, follow Baumann Cosmetic on Facebook, Instagram, and YouTube. You can also sign up for our newsletter by visiting www.derm.net, or email info@derm.net.